Duck confit is an ancient cooking method perfected by the French, but useful no matter what cuisine you are cooking. 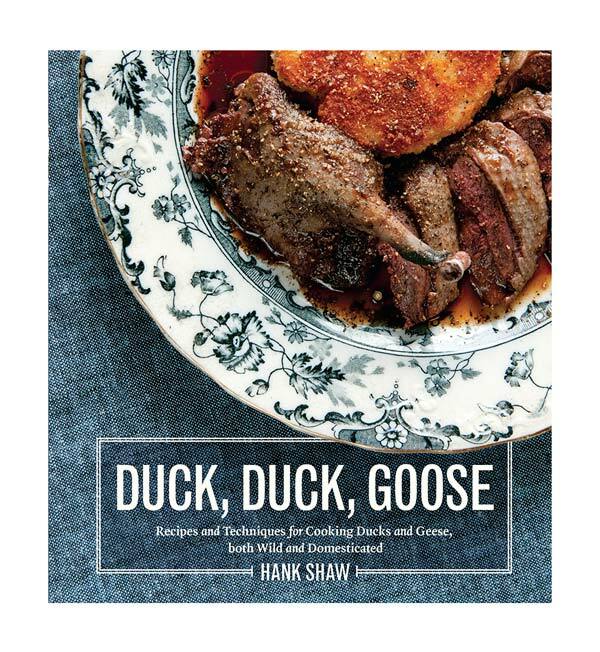 Every duck or goose hunter (or home cook, for that matter!) I’ve met who learns it has fallen in love with the process. 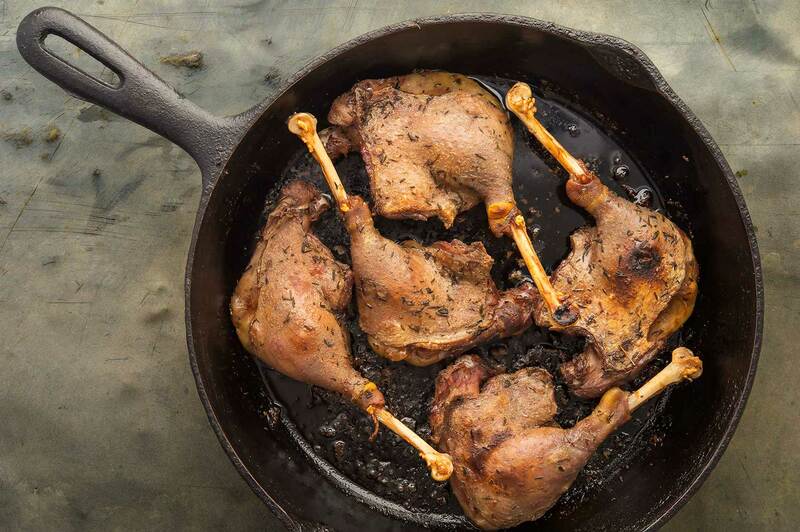 Confit, pronounced “con-fee,” is the single best method of cooking the legs and wings of waterfowl, as well as many other meats. Simply put, confit is salting something down for a while, then cooking it in fat, often its own fat. In our case, duck legs in duck fat. It is a technique thought to be invented in antiquity by the Jewish population of Egypt, even before Exodus. It has since become the province of France, where confit has reached its zenith. Traditionally, confit has been a preservation method. 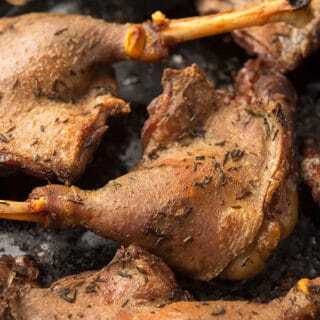 Duck or goose legs were heavily salted along with herbs, then slowly cooked in duck fat and stored in earthenware crocks, completely submerged in that fat. Kept in a cool, dark place, the meat would keep for months. Even modern confit, which is not so heavily salted, is far better “ripened” for a week or so than when it is served fresh. I do not recommend making confit from duck breasts. These are best served medium-rare to rare, not slow cooked. The French are known to confit breasts, and you certainly can if you’d like, but I think they become livery when cooked this way. My advice is to cure and confit large batches of legs (or wings) at once. Stored in the refrigerator, there is nothing better for a midweek meal than to pull out a few legs, crisp them up, pull the meat and eat it with… pretty much anything. Duck confit in salads, with pasta or cooked grains, in duck confit tacos or over polenta are all great ways to enjoy it. This versatility is the reason you see confit on so many restaurant menus in America. There are many ways to go about making confit. The traditional method requires several cups of duck fat, and while wonderful, gets a little costly if you don’t have a ready supply of fat on hand. A more modern way is to vacuum seal the duck with a smaller amount of fat, then submerging the sealed bag in hot water to cook, either in a sous vide machine, a stockpot on the stove, or even a cooler with hot water poured in it. Finally, there is a method of getting close to traditional confit that only requires a casserole pan and a low oven. All true confit begins with a salt cure. Duck legs are salted, along with herbs and spices, and left to cure for hours or days. In some cases curing salt – sodium nitrite – is also used, which gives the confit a rosy color and a slightly hamlike flavor. I’ve done it both ways, and each is good. Probably the hardest trick to confit is getting the salt the way you like it. I’ve had oversalted confit even in Michelin-starred restaurants. Everyone’s salt tolerance is different, so the recipe below will only serve as a jumping off point. When you experiment, err on the side of less salt rather than more, less time rather than more. Pro Tip: A great way to sidestep the “too salty” problem is to use what’s called an equalization cure: Weigh the duck legs in grams, then weigh out 1.5 to 2 percent of that weight in salt; the higher percentage will give you a more traditional cure. Use sea salt or kosher salt. If you want to use the curing salt, mix in 0.25 percent of it, too. 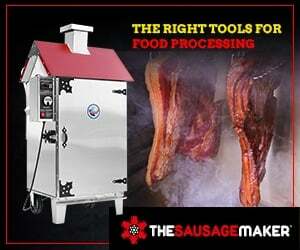 Massage this into the meat and vac seal for best results. Lots of people get all funky with their other seasonings in duck confit. I don’t. I strongly recommend you stick to a few seasonings, or none at all. The more you dress up your confit, the less versatile it will be in the kitchen. Confit is a beginning, not an end. Mix your salt, spices and herbs together and massage it into your duck or goose. Vacuum seal or put it into a sealed container in the refrigerator for at least 1 hour. This is far shorter than in a traditional confit, but it is better than nothing. I prefer to leave my cure overnight. For long storage in a cold cellar or any other place that is about 55°F, cure a full two days, and up the salt percentage to 2.5 percent. Long-cured confit will be too salty to eat as-is, but once aged at least 3 weeks it is markedly superior for stews or cassoulet. Think of it as a ducky French ham hock. Confit needs fat. Period. Duck or goose fat is preferred, but other fats can work well, too. Olive oil is one, especially if you happen to be confiting fish. Chicken fat is amazing with confit pheasant legs. As for ducks, you need that duck fat, although unsalted butter will do, as will lard. A solid fat is preferable so you can spoon it into a vac bag. Domesticated ducks and geese are so fat they won’t need extra fat at all if you do the vac seal method. Many sources will tell you that you can cook and eat duck confit in less than 3 hours. While technically correct, the end result is not like real confit. In fact, really good confit must be aged for days or even weeks before it reaches perfection. 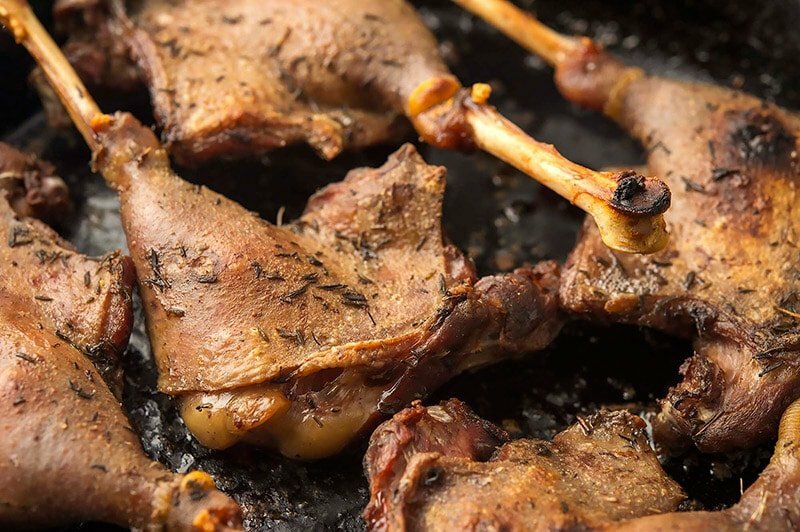 No matter what method of cooking you choose, please give your duck legs at least 3 hours. Wild ducks and geese typically need at least 5 hours. Your goals are to gently cook the meat so it is close to falling off the bone and to render out as much fat as you can. You can overcook confit, however. When this happens, the skin completely gelatinizes and becomes impossible to crisp later. 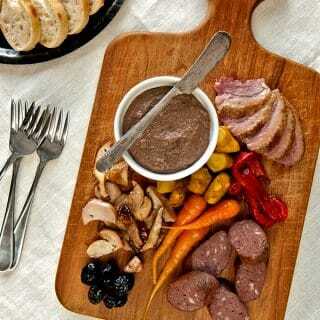 The meat is usually still fine, but as it continues to cook, it will become mushy, like stringy baby food. Even if you plan on stripping the skin off your confit, don’t take it past 12 hours. Gizzards are an exception to this, as are very old wild geese. Rinse the cure off when ready to cook, then pat dry. Totally submerge in fat — you will need 5 to 6 cups — and put, uncovered, in an oven set on “warm,” or not hotter than 200°F. Alternatively, you can do this on a stovetop with a weak burner set on low, or with a flame tamer. Watch that the oil never sizzles. Yes, you can eat your duck confit as soon as it is cooked. It’s wonderful. But an aged confit is even better. It’s the difference between a freshly made sausage and salami: There is a depth of flavor, a funkiness that sets it apart. To achieve this, keep your confit fully submerged in fat in the fridge for a week or more. If you want to age your confit longer, you will need to shift it from whatever you cooked the duck in to a clean container, preferably glass or ceramic. Sprinkle a little salt on the bottom of the container, then pour enough melted duck fat in to cover the bottom of the container by 1/4 inch. Put the container in the fridge and let it set. Take it out again and pack with the confit. Pour more melted duck fat around the confit to fully submerge. If you are using the fat you cooked the confit in, be very careful to avoid any liquid that’s come off the duck while cooking. This stuff is a flavor grenade (use it in place of demi-glace in sauces), but it can spoil your confit if left in contact with the meat and fat longer than a couple weeks. Once the duck confit is totally submerged in fat, you can keep it in a cool place for up to a month for normally cured confit, and up to 4 months with confit that was cured at 2.5 percent salt. When it comes time to eat your duck confit, you will need to extract it from its fatty bed. Bring the container out and let it come to room temperature. The fat will soften, so you can just reach in and grab a leg or two. If you’ve cooked your confit in a vacuum bag, immerse it in warm water to melt the fat. Scrape off any excess fat and set the confit in a pan skin side up. Set your broiler to high and crisp the skin under it. Keep an eye on the duck so it doesn’t burn. Or, you can roast the legs at about 500°F until the skin is crispy. Or you can set the legs skin side down in a frying pan, turn the heat to high until the confit starts sizzling mightily, then turn the heat down to medium and cover the pan. It will sputter quite a bit, but leave the cover on for a few minutes. Take the cover off and check to see that the skin has crisped up. Flip the confit and cook for another 3 to 4 minutes, just to heat through. I prefer the broiler method. You don’t need to crisp the skin on your confit, or even do this with skin-on legs. Enjoy! This is a standard French duck confit recipe, one I've adapted from experts like Paula Wolfert and Kate Hill. I prefer to do this with legs and wings, but you can confit breasts if you like. Also know that this works with any duck or goose; the gold standard for me are skin-on specklebelly and Canada goose legs. Mix the salt, thyme and black pepper together. Massage the mixture into the legs and wings. Make sure every part has some on it. Vacuum seal or put into a sealed container and refrigerate overnight, or up to a few days. When you are ready to cook, rinse off the legs, then dry well. If you are vacuum sealing, make sure the legs are not stacked. They need to be in one layer. Divvy up the fat into the bottom of each vacuum bag. Divide up the bay leaves into each bag. If you are not vacuum sealing, put the bay leaves in the pot of fat. Get a large stockpot mostly full of water and bring that to a bare simmer, a shimmy, really. Set the sealed vac bags in the water and cook at about 180°F for at least 3 hours, for store-bought ducks, and 6 hours or more for wild geese. The cooking time is about the same for the traditional method, which I do in an oven-proof pot in a 200°F oven. Remove the bags from the water and plunge into an ice water bath to cool. Remove them to a rack to dry, and when they're dry on the outside, store in the fridge for up to a month. To eat, you can shred the meat and use it that way, or eat whole and cold (a very good duck blind snack! ), or crisp up the skin in any of the ways mentioned above. You can find all sorts of recipes for cured and smoked meats and fish, as well as fresh sausages, here on Hunter Angler Gardener Cook! Nossi: You are right about the fast twitch, slow twitch thing, but rare or medium-rare red meat birds is just simply better tasting than fully cooked ones. Honorable people can disagree on this, but it is a fact that overcooked duck or goose breast is the single biggest reason some people reject duck entirely. Hank, do you have a link to a cassoulet recipe that you recommend? I just tried confit as a cooking style last fall. I have a nice stock pile of goose parts to try. I am wondering, as I am on a limited budget, could you confit in a crock pot, seems like a natural, set it, wander off to work, come back to supper. David: Yep, you can confit in a crockpot.